Congratulations to UNSOM awarded by the Colby Foundation with funding for the Colby Cassani Endowed Lectureship Series (CCELS). The CCELS ensures permanent placement of education about organ, eye, and tissue donation in the medical school's curriculum. The CCELS is a holistic learning experience for medical students, faculty, and staff. All aspects of organ, eye, and tissue donation are presented by professionals working in the field and by individual donors, their families, or transplant recipients. 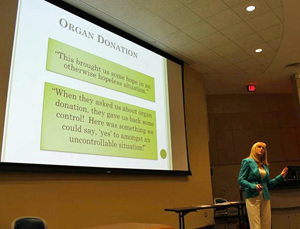 Speakers include a clinician who explores transplantation medicine and a representative from the regional Organ Procurement Agency who reviews the process and logistics of organ donation. Also presenting, is Colby Foundation founder, trustee, and mother of our foundation's namesake, Starla Cassani. Mrs. Cassani shares her own family's experience of organ donation in recounting Colby's story and the establishment of the Colby Foundation. also Seema Donahoe, and all of those who have worked behind the scenes to ensure the success of the lectureship. Over 8000 future physicians, faculty, and staff have already attended a CCELS funded by the non-profit Colby Foundation. Our work to educate continues thanks to the generosity of the Colby Foundation's contributors! Together, we are accomplishing our mission to educate nationally.